I’ve borrowed this title from Anke Voss-Hubbarb’s article in the American Archivist because it sums up the experience of my own frustrations over many years as Archivist for the Presbyterian Church. What you may ask was the root of this frustration? As in ‘No documents – No History’, the historian, Mary Ritter Beard, became more and more disturbed and frustrated at the lack of women’s voice in the various archival collections she was researching. From the 1920s until her death in 1958 she rigorously campaigned to gather women’s papers and records. Not only to be stored in suitable academic and archival institutions but she pressed the need for women’s voice to be integrated into university faculty programmes. A familiar and frequent cry heard from many an Archivist today. Mary Beard made a pertinent observation: ‘without knowledge of women in history as actual history, dead women are sheer ghosts to living women—and to men’. Ann Braude forty years later again takes up Beard’s concern when researching women’s role in religious organisations and churches. ‘We cannot understand the history of religion in [a country],’ she argues, ‘until we know at least as much about women who formed the majority of participants as we do about the male minority who stood in the pulpit.’ How true! What a researcher will discover when first confronted with the Presbyterian Church official collection is the gender-blind, hierarchical and pietistic nature of the church’s historical past. Researchers will find women’s voices are silenced within the dominant historical narrative, which categorised all people as one under the notion of ‘man’. Even though the General Assembly gave its blessing to the formation of a Deaconess Order in 1906, and in 1916, accepted women onto several General Assembly Committees to give advice, with no voting rights, and gave grudging approval for women to serve as Home Missionaries from 1920, their voices remained securely locked on the margins. It is not that women’s records are lacking in the overall Presbyterian collections, far from it in fact. There is a parallel collection to the Church’s official documents that date back 120 years, located at the congregational and women’s organisational level. During these 120 years, resourceful women sought their own sacred spaces, formed communities, and began to express a gendered spirituality. From that time women’s agency became increasingly more visible and their space more gendered, but at the same time their exclusion from ordained ministries more dogmatically denied them. In these extensive collections researchers will find women teaching in Sunday Schools, even doctrine to the horror of some critics, leading youth groups, writing hymns and prayers, compiling missionary talks and studies, yes even speaking from the pulpit, leading study groups, and creative means of promoting, supporting and raising money for the Church’s mission schemes. They were called to clean and polish the church, wash the communion linen, arrange the flowers, serve tea, organise fair stalls, raise funds for furnishings and so it goes on. There are tantalising anecdotes given in newspaper reports of women in large numbers attending theological lectures, following Evangelists from meeting to meeting, weeping as they farewell them at the railway station, and being rebuked for displaying their disapproval by shuffling their feet and shaking their handbags. But the voices that tell of the callings, faith journeys, beliefs, recollections and memoirs from this vast and diverse multitude of women rarely are heard within the Archives and are therefore omitted from our church and religious histories. The APW has made valiant attempts in the last two decades to correct this imbalance by capturing women’s voices, literally, through their oral history project ‘Women’s Stories’ and under Nan Burgess’s editorship, four biographical publications, A Braided River of Faith, have reached our shelves, significant, but underused resources. Is the paucity of documented women’s papers due to women perceiving their experience within the institutional church as falling outside the narrative of what counts as a ‘serious’ church history’? The ‘fathers and brethren’ accepted the women’s organisations as auxiliaries to their more important activities within the church structure. It was taken for granted by the fathers of the Church that women’s work was a ‘service of mission’; it held no recognised status or standing within the male-centred Church’s definition of ‘ministry’ The women, were there to serve the Church and its decision making processes. I was always surprised the number of times my request for any archival records from women active in the spiritual journeys of their congregations and organisations was by and large rejected. ‘Oh there is nothing worthwhile in my papers! ‘No one wants to know about me’! ‘I didn’t do much to make an impression’; even though this woman had 65 years in two congregations and almost 50 active years in the PWMU. Perhaps it is this next response though, that sums up the rejections in general. 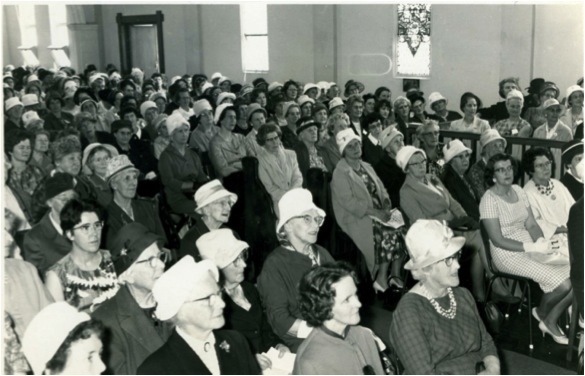 ‘We kept dad’s sermons but we didn’t really believe mum’s papers had much in them’!, Do these responses reflect how deeply embedded the prescribed divisions of gender in society and church over many centuries have shaped women’s past lives? How sad for women to consider their experiences as less important and therefore, contribute little to the overall historical narrative and its analysis. The reluctance of women to acknowledge the significance of their voices results in only half of the Church’s story ever being recorded. ‘No documents-No history’ is a slogan we could well use. We cannot tell our story as a Church unless we know who the characters are. I continue to be stunned at the depth of Molly Whitelaw’s remarkable collection. It is a fine example of how the accumulation of women’s stories and voices would recover the many invisible women and place them with pride in the Church’s historical narrative. To voice Psalm 68:11: ‘The Lord gave the word, great was the women who published it’.